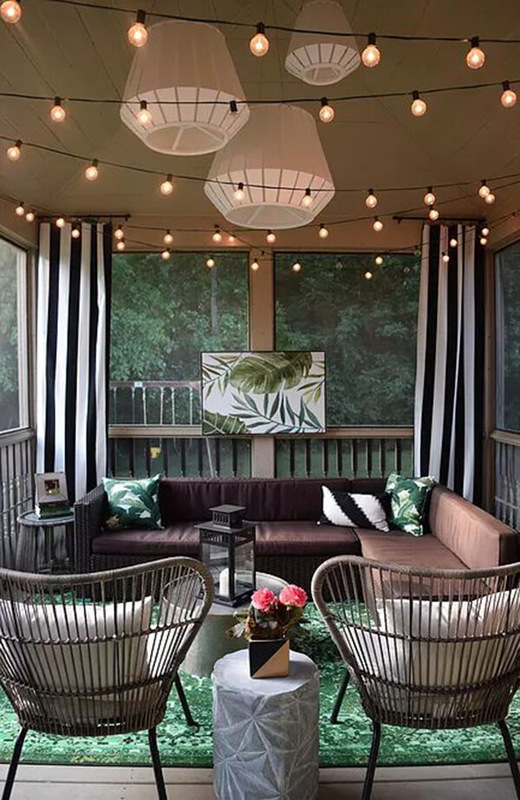 When the days start to heat up, the sun extends its hours, and the warm evening air beckons you outside, it is so nice to have a cozy outdoor space to relax in. 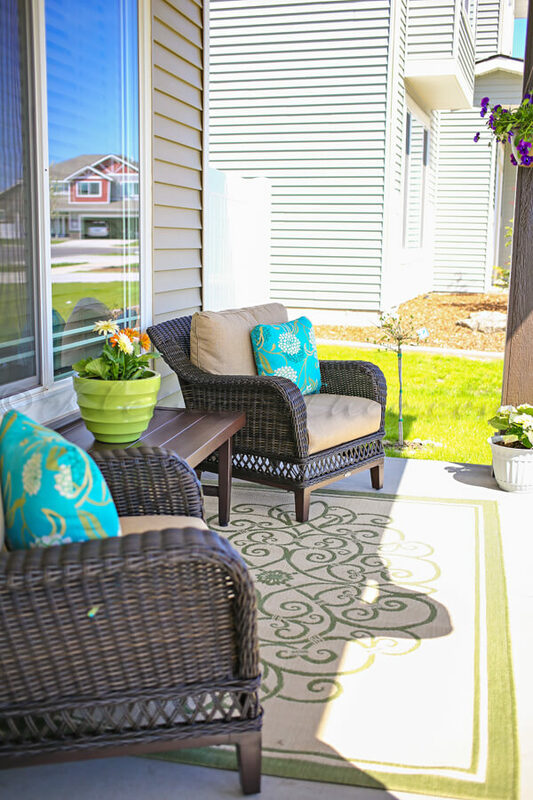 While others are celebrating baseball season, fireworks, and big vacation plans, you have something right in front of your home that is worth cherishing all summer long: your front porch. 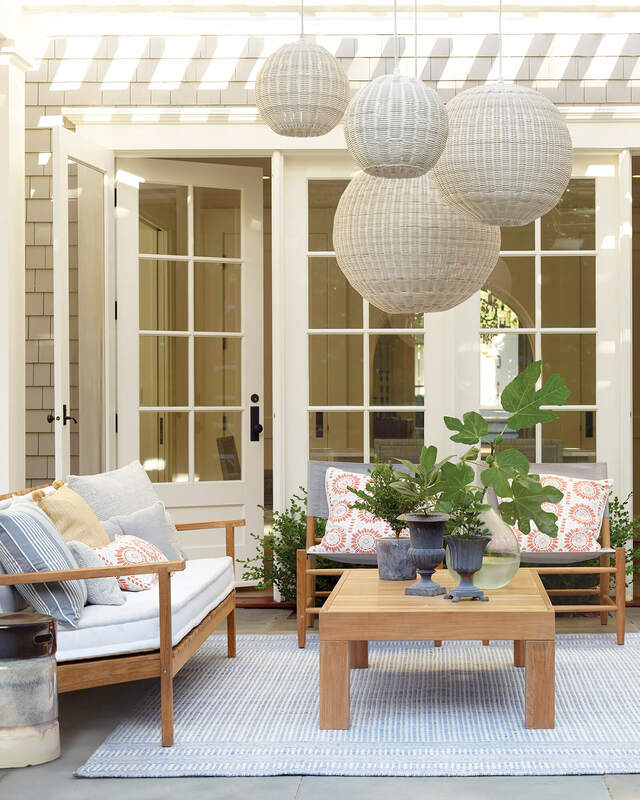 No matter the size, shape, or style of your porch space, you are sure to find a stellar option for you among these 21 excellent ideas. 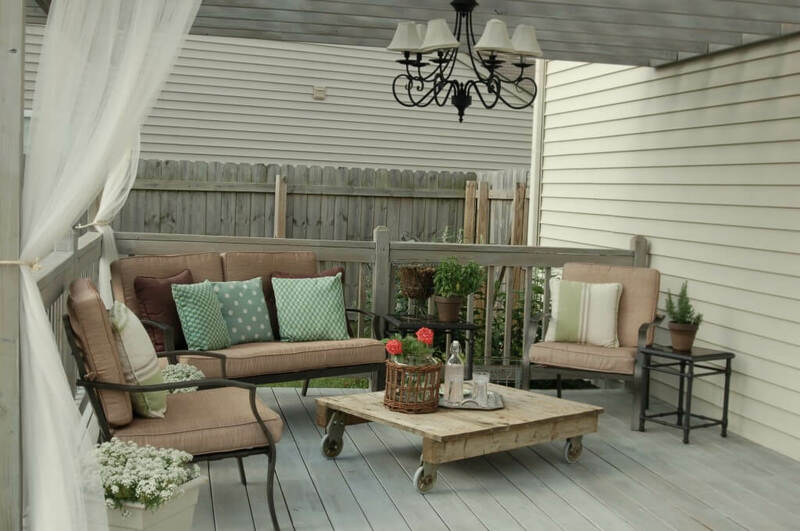 You can create a whole outdoor living room or add a few simple pieces of furniture. 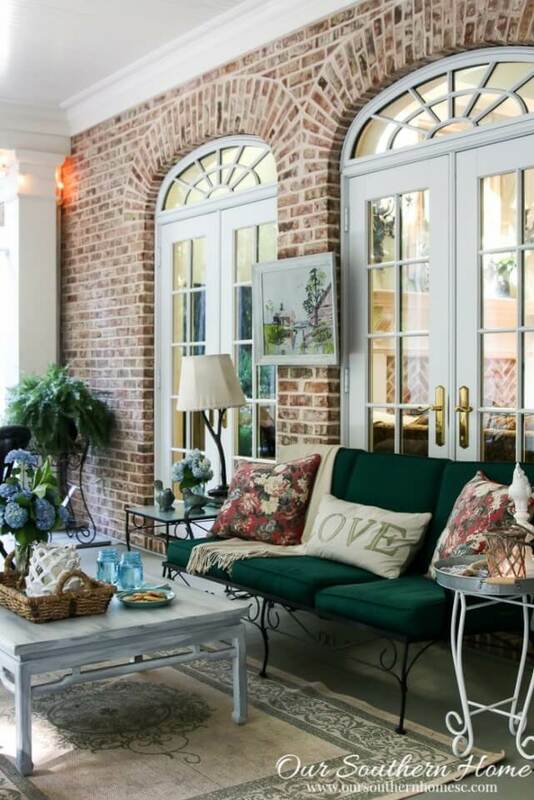 Either way, you can transform your porch from being the place where one enters your home to a space made for friends and family to gather, breathe in the outdoors, and enjoy each other’s company. 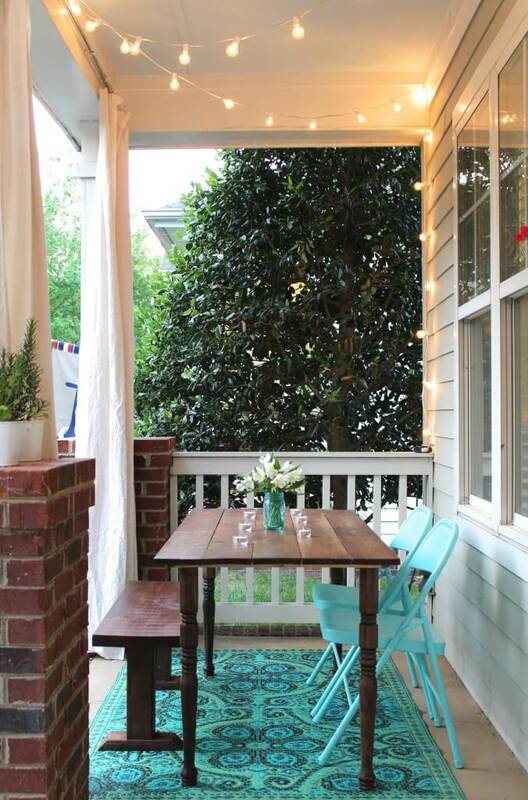 When planning your porch decor, be sure to consider how you want to use your space. 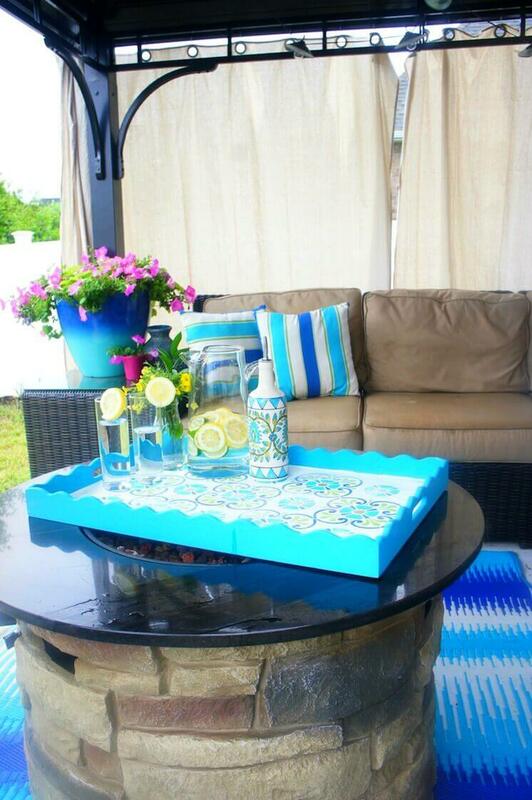 Will you be hosting parties, or will it just be you and your sweetie catching evening rays and sipping lemonade? There are great design options here for whatever you choose. Remember, too, that you can always modify an idea to best fit your layout. 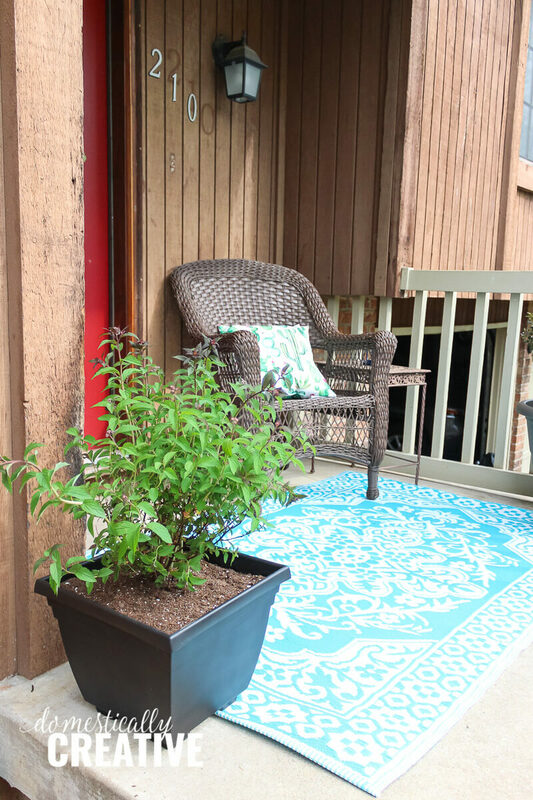 Create your own little paradise right outside your door by transforming your porch space into a private paradise. With the right lighting and decor, your space can feel like a little getaway that you can escape to any time. Add curtains for a touch of stylish flair and optional privacy. Eating dinner outside on a warm night is common in many parts of the world, so why shouldn’t it be here at your own home? With this night dining set right on your front porch, you can greet neighbors on evening strolls and enjoy fairy lights and flowers as the sun sets right beside you. If you enjoy shopping and decorating, then a look like this a good choice. With an eclectic look rooted in chic vintage designs, you can easily pair all your favorite finds in one place. As you can see here, fresh flowers and plants are always the perfect way to tie together any living space. 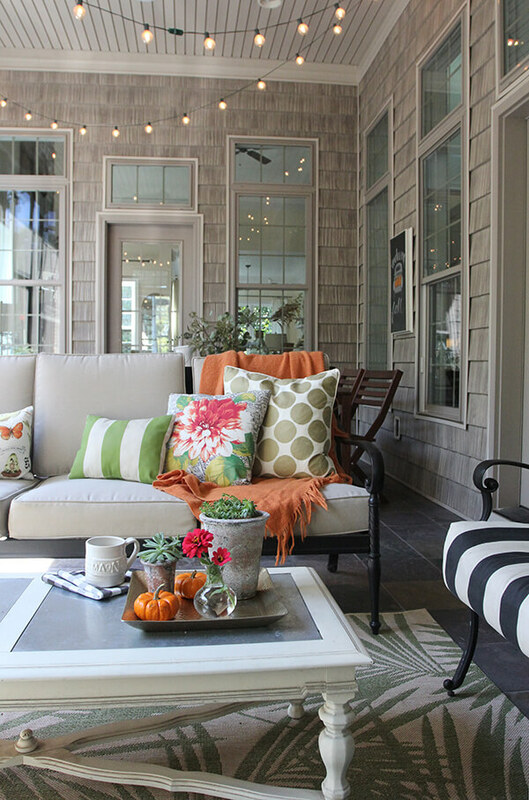 A comfy outdoor sofa can be a smart investment, as it welcomes those around you to sit and relax. The decorative style pictured here inspires you to enjoy those warm late summer and early fall days with mini pumpkins and rich autumnal colors. Even once the temperatures have cooled, it is still great to go outside for fresh air and a cup of tea. These vintage chairs pair are tied together with this cozy swing by incorporating matching light summer colors on an abundance of fluffy outdoor pillows. If you plan to host in your space, be sure to add a small coffee table. 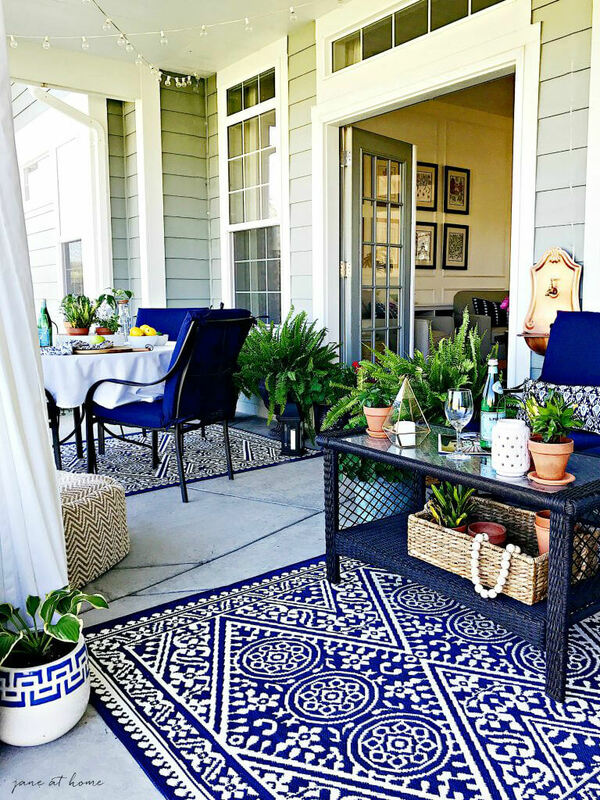 If you can incorporate a matching outdoor rug, then all the better. The warm colors of this look reflect the late evening summer sun. With a few spots of bright fresh greenery, an opaque rain cover, and glowing Edison bulbs, this is the ideal place to relax at the end of any day. Thanks to the covered roof, you are able to get more use out of your patio well into the fall. This design has captured many of the elements that make outdoor living so attractive. There are comfortable chairs, beautiful decorative elements, lots of plants, and a visual centerpiece with gorgeous hanging lights. Choosing a bold focal point like this can make a statement and truly set the tone for your space. 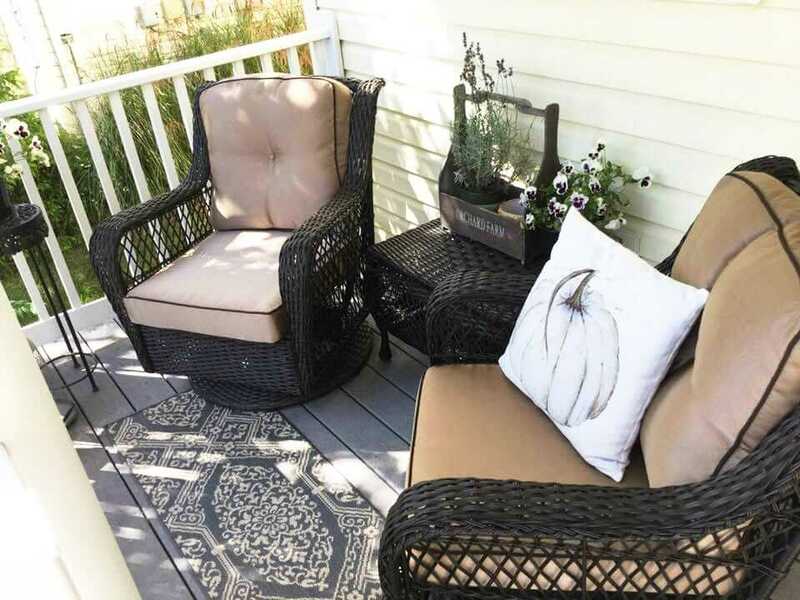 If you are hoping for a porch to relax on, somewhere you can catch your breath and enjoy the splendor of a warm evening, then this setup is a grade-A choice. With sweet farmhouse touches, including fresh lavender, wicker chairs, and vintage decor, you will be transported to simpler days. If you are looking to add a pop of color and fun to your life, consider creating a space similar in design to this one. When you use bold colors, everyone will know that your house is a place for a good time. This design marries bright yellow, pink, and blue for a cheerful look without going overboard. “Fresh” is the word that comes to mind with this bright watermelon rind green patio set. 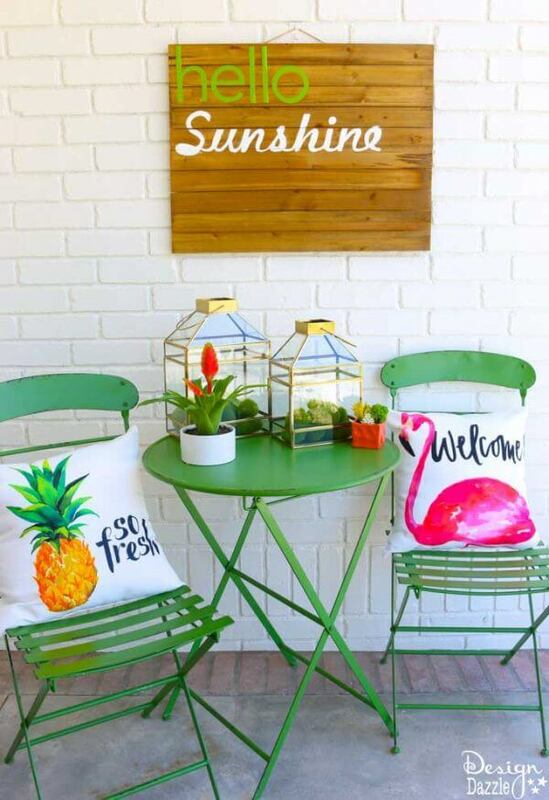 The decorative additions of cacti, pillows, and an adorable summery sign create a complete look and an inviting space. For your set, you can choose any color you like; just be sure to carefully select decor that matches your color scheme. 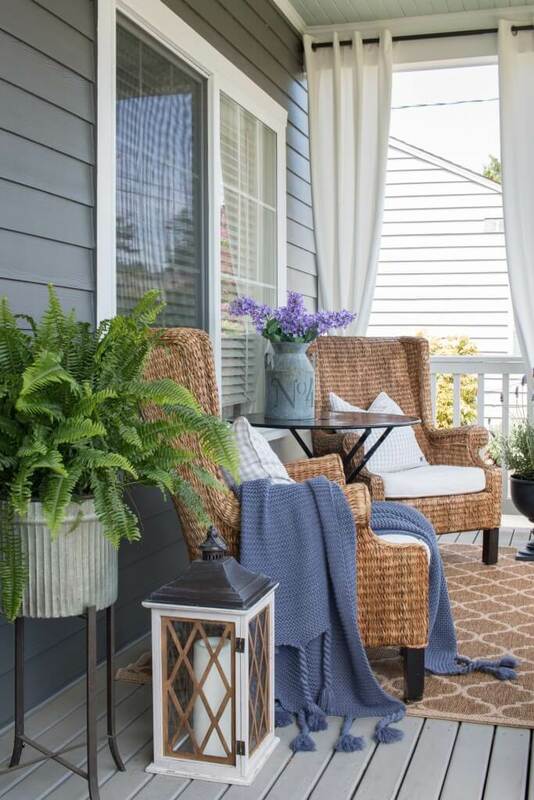 This look is reminiscent of days gone by with its classic wicker chairs and adorable porch swing. Although the gathering area is at the heart of this look, there are decorative elements scattered throughout that give the design a sense of completeness, such as the watering can vase and the beautiful stained glass. 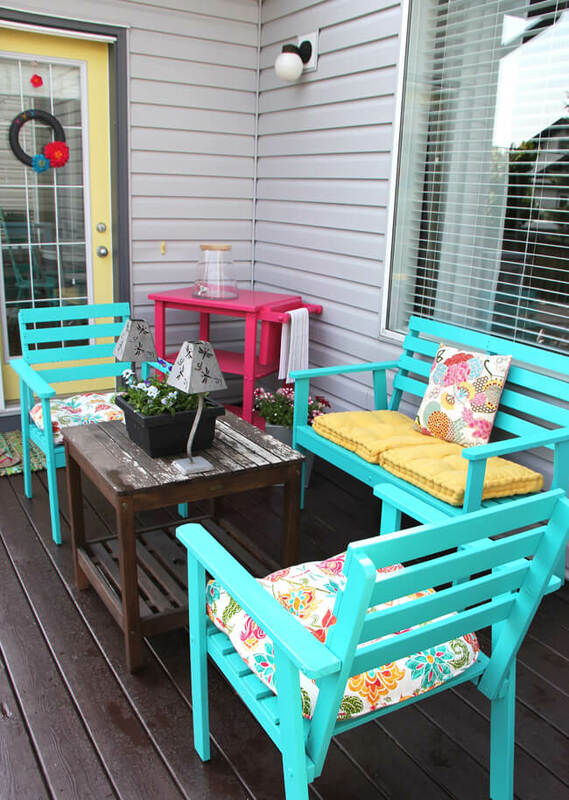 With a chic color theme, this matching patio set offers so much life and vibrancy. Everything from the rug to the dining chairs, and even the potted plants, weaves a thread of that bright true blue for a cohesive and appealing look. With a dining table and living area, you can practically bring your whole life outside. 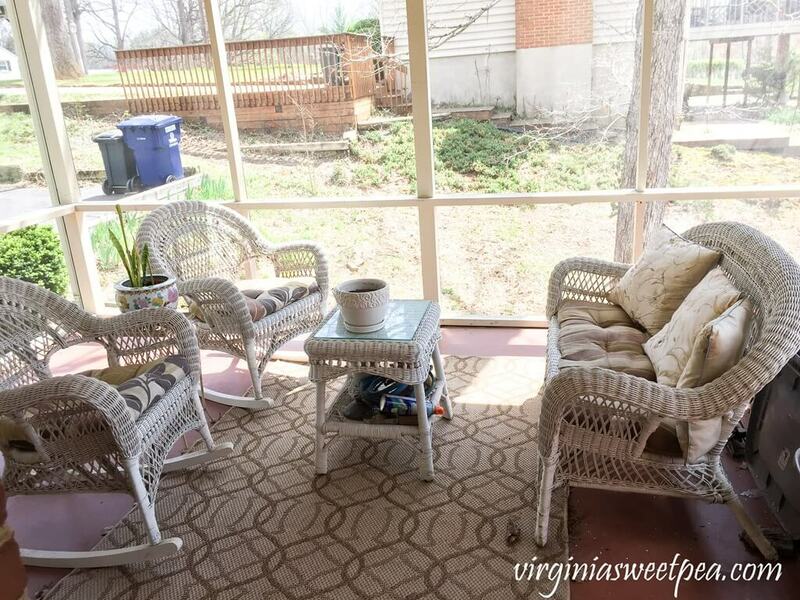 Everyone loves a rocking chair, and when you place one on your porch, having it made of wicker is simply classic. 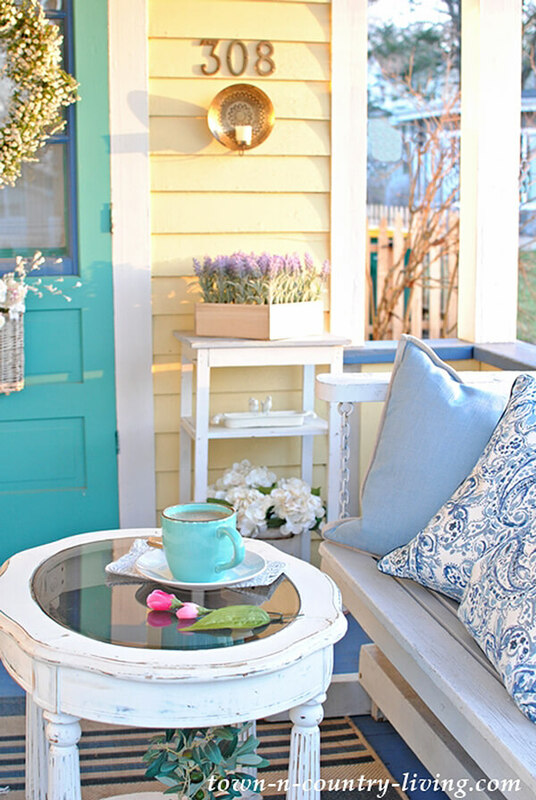 This porch decor idea is great for those who want to keep it simple and focus on conversations. A rug and small coffee table add a level of comfort. 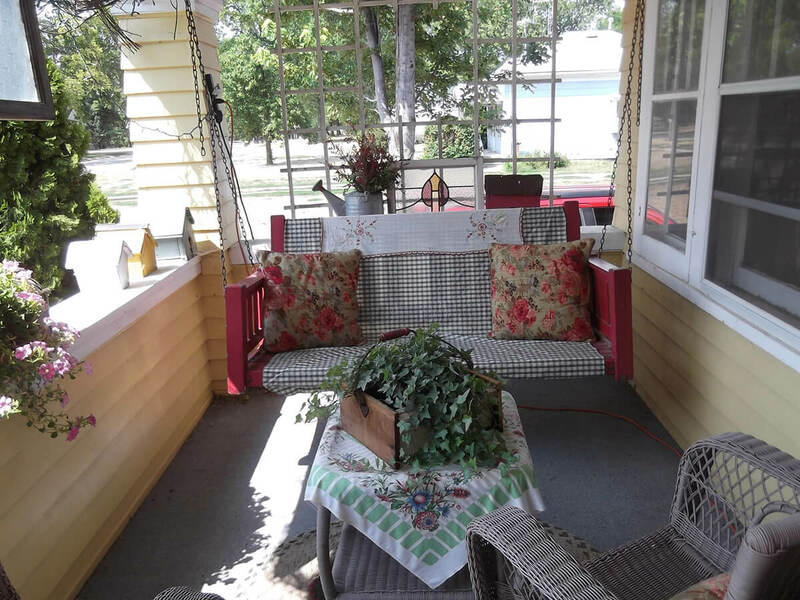 There is something easy and light about this beautiful porch layout. The cheerful blues are welcoming and calming, and the gorgeous, slightly weathered glass-topped table is a beautiful addition to the look. You can just imagine cuddling up on the cozy bench for a late night chat and cup of tea. When you live in a friendly neighborhood, a set up like this one is ideal. 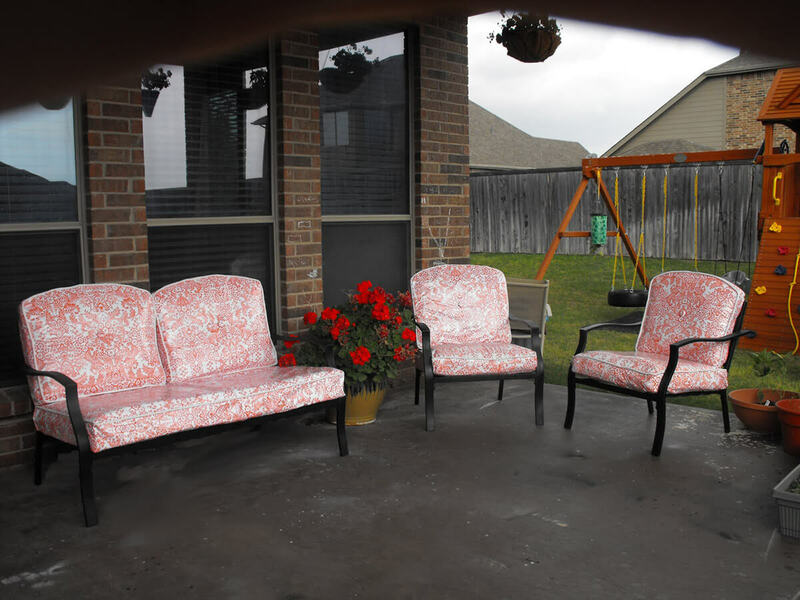 With both chairs oriented outward, you are in the perfect position to chat with neighbors on their evening strolls. 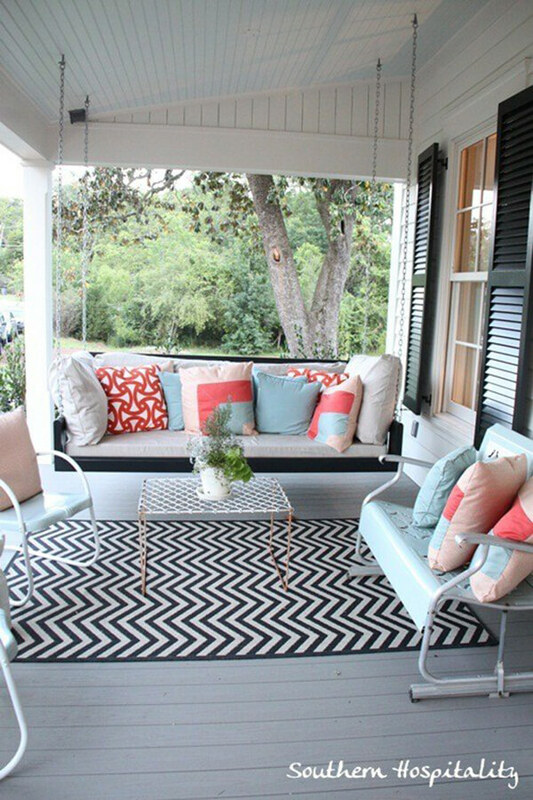 Adding a soft cushy rug means you don’t even have to bother putting your shoes on to enjoy your cozy porch. If hosting evening gatherings is something that interests you, then you should consider a set up like this. With a gorgeous fireplace by evening and a table by day, you will have the whole neighborhood vying for a spot on your porch. Also, be sure to note the lovely blue and light brown color scheme, as well as the fluttery privacy curtains. If natural elegance is an appropriate descriptor of your homes style, then this easy and beautiful design is a good choice for you. The chandelier and light airy drapes gives this look an air of romance, while the bare wood DIY-style coffee table grounds everything in an upscale rustic casual vibe. When designing the perfect porch for your family, be sure to think about how you plan to use it. This set-up is perfect for a couple who wants to enjoy one another’s company while observing the world around them. A few small decorative elements make this a cozy spot for a chat, or just a cozy place to sit and relax. 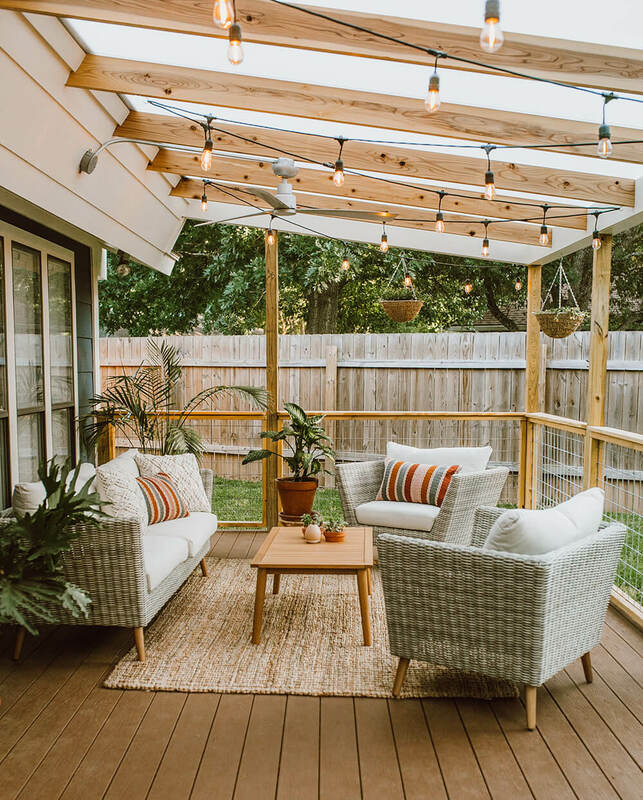 When you want to keep space open, you might consider just picking up some beautiful patio furniture and going for simplicity. In households with kids or pets, tables, vases, and other decor, while beautiful, can have a habit of getting knocked over. To avoid broken furniture (and broken hearts! ), invest in some quality chairs and a large sturdy potted plant. 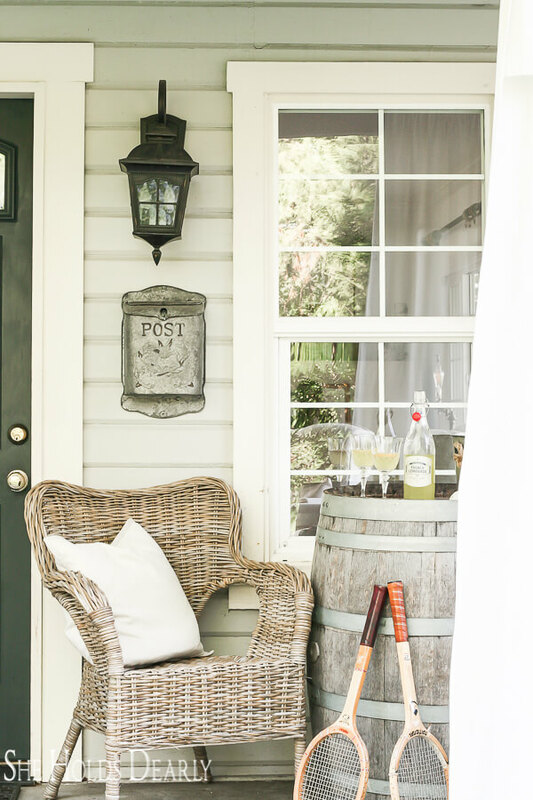 Using a wine barrel as a table is always a neat idea, and when paired with this adorable wicker chair and other farmhouse chic elements, you have a porch look that is straight out of a dream. Keeping everything light wood makes this look easy and elegant, while additional touches like the vintage post box keep it interesting. When the sun is shining down on your face, sometimes you just need a good chair to lean back and enjoy it. A simple outdoor rug is great for kicking off those shoes, and a small end table gives you somewhere to set your iced tea. Bring out a favorite novel and soak up your porch all summer long.